Last minute travel plans during peak season can leave you with little or no option for accommodations. But sometimes last minute options can lead to a great experience, just like what happened on our trip to La Union. 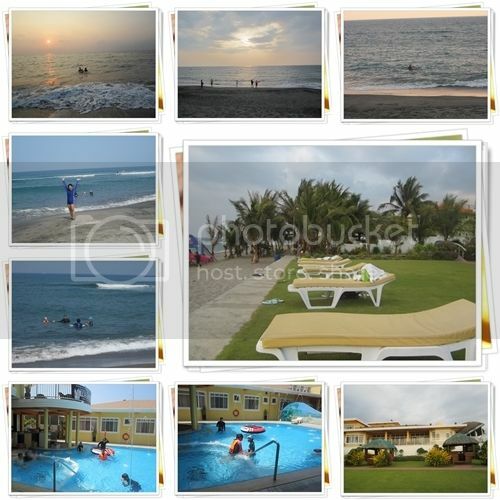 My sister booked us at Awesome Hotel in San Juan La Union. It was a relatively new hotel and I was a bit skeptic about it. As it turned out, our stay in Awesome Hotel was a pleasant vacation that we really enjoyed. The reception staff were friendly and they made us feel welcome immediately. We checked the pool and beach facilities first because these are the main reasons for our stay. The beach area was clean and not crowded, just perfect for those who want to relax. The waters are also clean but the waves are a bit big and strong. It is great for surfing but can be difficult to swim for little ones or weak swimmers. Aside from the waters of Awesome Hotel, I was also interested in their menu. The Awesome Menu includes a variety of cuisine like Filipino, American, Asian, Italian, and Japanese. 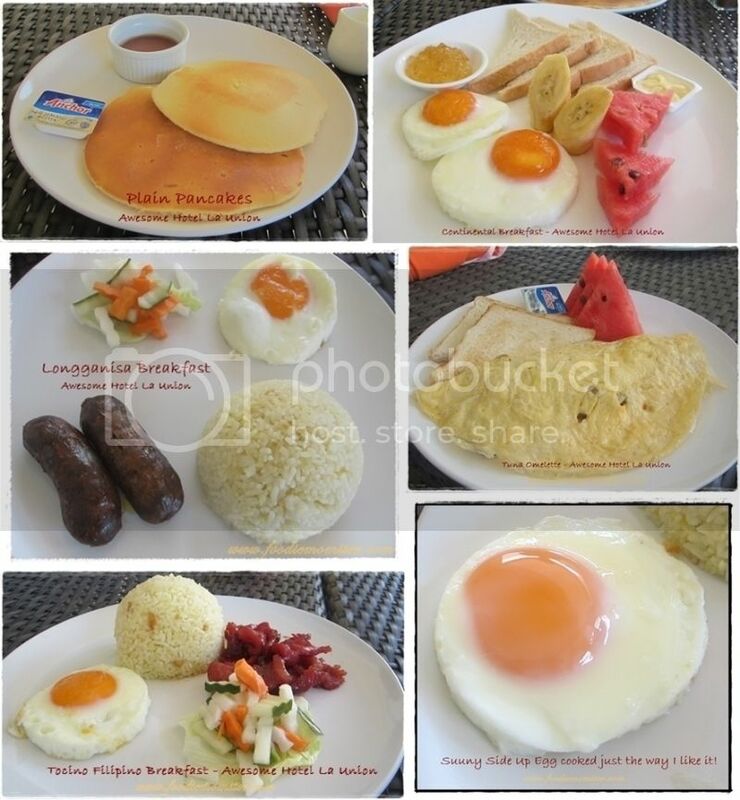 My favourite breakfast item is the sunny side up egg which is cooked just the way I like it. That means no brown on the white, while the yolk is well cooked at the bottom and a bit runny at the center. The eggs on my Continental Breakfast during our first day was just perfect. Mommy Foodie liked the Tuna Omelette served at breakfast. The fish was fresh and tasty, definitely not the canned variety. We also enjoyed other Filipino Breakfast fares like the Daing na Bangus, Tocino, and Longganisa with Garlic Rice, Egg, and Side Dish. Lunch and dinner fares that we tried include Pinakbet, Adobo, Bistek Tagalog, Sinigang na Baboy, Sinigang na Malaga, Calamares, Seafood Platter, and Fish Steak. I liked the veggies in the pinakbet and flavoured with just the right amount of fish sauce. It was supposed to be topped with deep fried pork belly but the pork lacked the crisp and dry feel of deep fried ingredients. Nevertheless, we finished off the whole dish at the end of the meal. 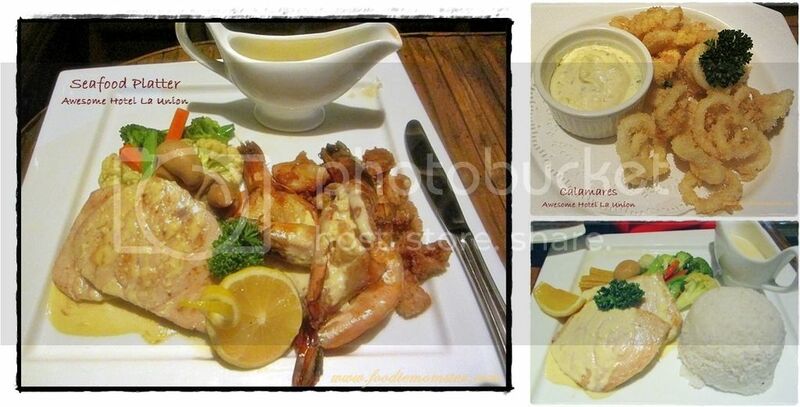 I loved all the seafood dishes especially the Fish Steak. It has grilled blue marlin with rice and buttered vegetables on the side. The fish was not overcooked and the gravy that came with it doesn’t overpower its natural flavour. I also liked the buttered vegetables with its bright colors and crispness. For desserts and refreshment. 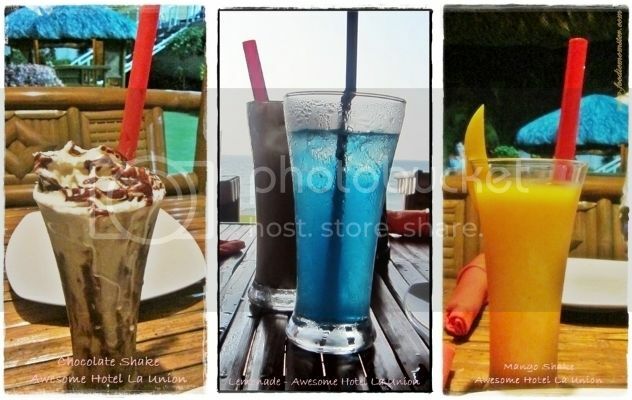 Try their fresh buko juice and fruit shakes. They are really refreshing and filling too. Halo-halo is another classic favourite that you can enjoy at Awesome Hotel. It has minatamis na saging, two types of sago, gulaman, mongo, camote, and nata de coco topped with ube ice cream, halaya, and leche flan. The best thing that I like about all their dishes is the fresh ingredients and the subtle flavors. I may not rave about them, but they are certainly good enough for repeat orders. I found the rooms to be clean, comfortable, well ventilated and spacious. The mattresses are great for a well-rested sleep. I also liked the outdoor pool and the splash bar which is awesome for both kids and adults. The huts and lounging area at the beach front are perfect for watching sunrise and sunset. I say, this place is awesome in its own way. If you are going north, check out Awesome Hotel and experience their awesome food and waters.